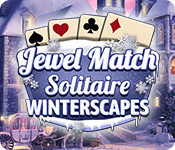 Jewel Match Solitaire: Winterscapes is rated 4.2 out of 5 by 19. Rated 4 out of 5 by kim0530 from Another good Jewel Match game. It's true, this is what Solitaire is supposed to be. Not a big fan with mahjong (but to each his own) but in this game has different styles of solitaire which is a little be harder. Which is fine by me. But the main reason why I gave this a four stars and not five is for one reason. Please no more Christmas music. Jewel Match Snowscapes game has enough Christmas music. You did an excellent job on Twilight and Twilight 2. That is why I was disappointed when I heard some Christmas music mixed in. I do know there's a lot of relaxing music that has winter themes. Rated 4 out of 5 by Puzzlenutty from Pretty, soothing, and challenging. I'm a fan of the Jewel Match solitaire games, so I buy them as soon as they come out. As usual, they didn't disappoint with the beauty of the game and the difficulty- keeps me doing rounds over and over til I get it right. My ONLY complaint is the horrible music. I don't want to hear endlessly cycling muzak-style Away in a Manger! Even a simple original theme would be better. The snow is lovely and the card art is very good. The usual vines, suit blocks, and fabric blocks, but that's just fine. If it ain't broke, don't fix it. A great buy! Rated 3 out of 5 by cloudshadow from Same thing, different castles I have all of these. ll are super frustrating in the fact that you rarely get all three stars in any hand the first time playing. I have learned that when you finish the game, and go back and start over for a second time, three stars and points are everywhere. In the other games, the second time, I have bought everything I can, and still have over 10,000 points and nothing to use them on. I'm not sure they the developers have to make the first round so hard to beat and then let everything fly for other rounds. In my opinion, it's pointless to make the games un-winable first round. I wish that they would make building the castles optional. I skipped that on the Halloween version, and the game froze up 2/3 of the way through and I had to start over. On the plus side, the game assumed I had already played all the way through, and getting three stars almost every hand was easy. I say I'd like to see some other themes, but after grabbing 4 of these with free games, I'm pretty bored. each game is the same. No difference except seasons of the castles that you have to build, no matter what. If you aren't getting these with your free games there is no need to buy al 4, because they are all the same. Just grab one and play it over and over, because the second rounds are easier to get the stars. This will be the last one of these I get. They aren't that great,and my freebies can be used on other stuff. Rated 3 out of 5 by beltie from Nice - Good have less Obstacles I agree with CowClaudia. With all the obstacles (vines, ice, blocks, etc) one has to replay a level way too many times. This takes away from my enjoyment. Don't get me wrong, I like some challenge, but this is just to much. I'll play Solitaire to relax. The accumulation of $'s to purchase upgrades could also be more generous. As far as the music, it is easy enough to mute it. Graphics are nice and crisp and gameplay is smooth. The only other annoying item I find, is having to tell the game when I'm done with a combo run. Really? Maybe I'm missing the need for this. Didn't have to do this with the earlier games and it's just another click in a game full of clicks. Overall though, enjoying the game. Rated 3 out of 5 by DebCis from Solitaire and More Solitaire... This game is similar to the other Jewel Match Solitaire games. What I don't like about it is that it is all solitaire. My favorites in the series are L'Amor and Twilight. Both of those have Mahjong bonus games which are sort of like 'palate cleansers.' Not horribly challenging but fun. As much as I like the series, I won't be purchasing this one. Rated 2 out of 5 by CyndiLouWho2 from Winter does NOT mean Christmas I own all the other Jewel Match Solitaire games developed by Suricate. So when this one was released a month ago, I paid a premium price for it. However, it turned out to be a big let-down to say the least. The background audio is Christmas music and carols. I paid top dollar for this newly released game last month and when I heard the music, I was truly disappointed. This was the very first time I've ever muted the music on a Suricate game. Someone needs to tell them that the winter season lasts for months and cannot be called Christmas, which is a one day holiday. So after muting the music, I found the game to have no new features or power-ups. Once again you collect coins to buy power-ups, which have remained exactly the same. And you accumulate gems to buy sections of a winter village, which you end up completing and then moving on to re-build a new village. 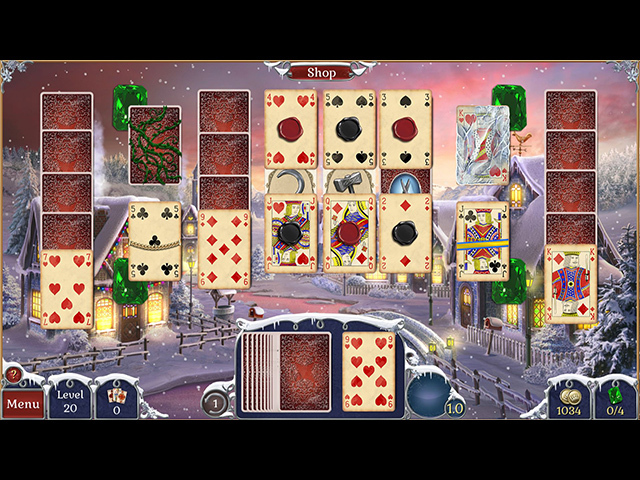 The added bonus games this time around were not mahjong, but different types of solitaire games. Now those seemed promising, except the cards were too small, they were hand drawn, and poorly illustrated. So, those bonus games will remain UN-played. It's a mystery why those added games couldn't have been created with the same beautiful graphics as the main game. This developer needs to change things up and come up with something new. 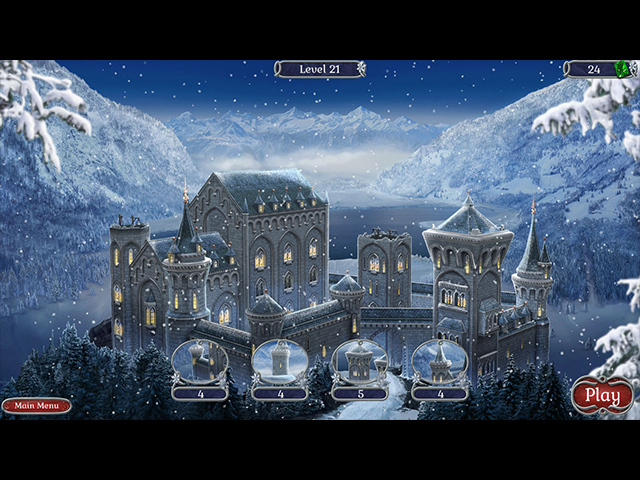 Rated 2 out of 5 by awatomic from Lovely Christmas game Yes, folks, this would have been a lovely game to play over Christmas, but why oh why has it been released by BFG in February? Unlike other reviewers, I find looped carols, Auld Lang Syne and random Scottish tunes annoying at this time of year and reminiscent of supermarkets in the run-up to Christmas. 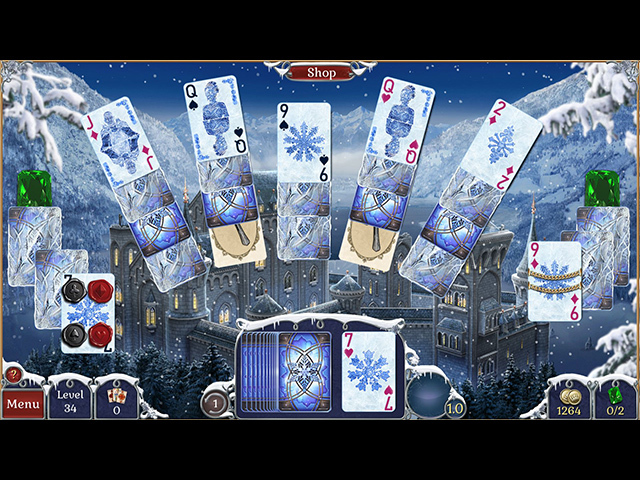 The scenes are pretty (for Christmas) and the card designs are clear, so that's a plus, but the gameplay is pretty standard. Very disappointed.